Made from 925 Sterling Silver with sparkling beads interspersed with labradorite stones, this is the perfect ring to add depth to your Love Revolution ring stack, it looks great layered with other rings from ChloBo to create a fashionable bohemian look. Labradorite is the calming stone, known for its healing properties, combined with the Make Love Not War charm, this ring is all about positive vibes. From the Autumn Winter 2015 collection from ChloBo, Love Revolution. Be inspired by the love and liberation of the swinging 60s and 70s of Haight Ashbury in San Francisco where this collection was created. San Francisco's liberal and positive energy, vibrant vintage shops, buskers and artistic streets are the inspiration behind this fabulous collection featuring flowers, peace signs and disco stars. 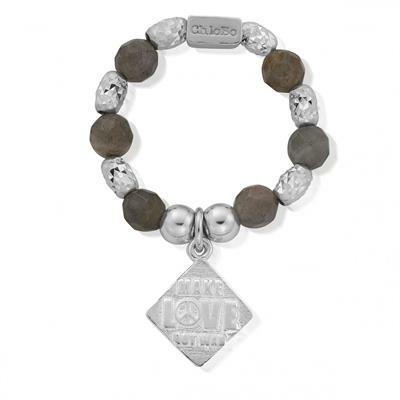 Be liberated by love with the Love Revolution collection.